We’d love your help. 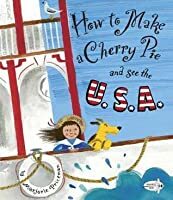 Let us know what’s wrong with this preview of How to Make a Cherry Pie and See the U.S.A. by Marjorie Priceman. IN THIS EXUBERANT companion story to How to Make an Apple Pie and See the World, our young baker sets her sights on a cherry pie. She heads off on a round-the-U.S.A. journey to find all the materials she needs to stock her kitchen: New Mexico for clay (mixing bowl), Washington for wood (rolling pin), Hawaii for sand (sand? to make the glass for her measuring cup, of course IN THIS EXUBERANT companion story to How to Make an Apple Pie and See the World, our young baker sets her sights on a cherry pie. She heads off on a round-the-U.S.A. journey to find all the materials she needs to stock her kitchen: New Mexico for clay (mixing bowl), Washington for wood (rolling pin), Hawaii for sand (sand? to make the glass for her measuring cup, of course). In joyful art filled with small vignettes and sly humor, two-time Caldecott Honor winner Marjorie Priceman takes us on a cross country journey by riverboat, taxi, bus, train, plane—all in search of the natural resources of our country. 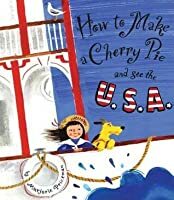 Includes a brightly painted endpaper map of the U.S.A.—and a recipe for cherry pie, of course! 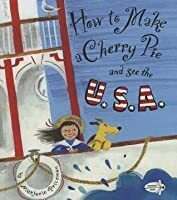 To ask other readers questions about How to Make a Cherry Pie and See the U.S.A., please sign up. Be the first to ask a question about How to Make a Cherry Pie and See the U.S.A. I loved Priceman's How to Make an Apple Pie and See the World and maybe if I hadn't read that one first, this would have been a solid four-stars for me. But, I found it a bit lacking in comparison. In this version, the little girl wants to make a cherry pie. But, the pie shop is closed for 4th of July. So, she sets out across the USA to gather the raw materials needed to make the baking instruments she will need: "New Mexico for clay (mixing bowl), Washington for wood (rolling pin), Hawaii for sand (sand? to make the glass for her measuring cup, of course)." Of course, it's very fun to travel across the country with her and her cute little dog, and maybe kids would simply be fascinated to know that plastic is made from oil and glass is made from sand--I mean, it's cool, right? I think my boring grown-up brain just got in the way here. I thought it odd that the girl didn't have the instruments to bake a pie but yet had the equipment to turn sand into glass and oil into plastic. Her trip across the country was back-and-forth, not in a logical geographic sequence. She goes to Alaska for no reason except to look around. And, most of all, it was odd she already had the ingredients for the pie but not the equipment. I guess they wanted to go a different direction than the "Apple Pie" book (in which she gathers the ingredients). Then, too, there is the whole "take only memories, leave only footprints" motto to consider as the girl goes from forests to beaches taking raw materials. I recently read this author-illustrator’s book How to Make an Apple Pie and See the World and I loved it, so I sought out this book. It’s a silly but educational story about a girl who wants to bake a cherry pie but she needs a few more things to do that, and the store is closed, so she, and her adorable dog, take a trip across the U.S.A. to procure the necessities. Along the way, the reader will learn about a few states, and other things such as how glass, cotton material for potholders, etc. are made. A link between natural resources and their end product is shown, in a fun way. The dog does the cutest things in many of the illustrations. The illustrations are glorious. I loved them. I thought that this one was just as much fun as the “See the World” book and would love it if books about other countries or continents and flavors of pie get published. This is such a fun book! I'm using it in our homeschooling studies as we learn about the states. 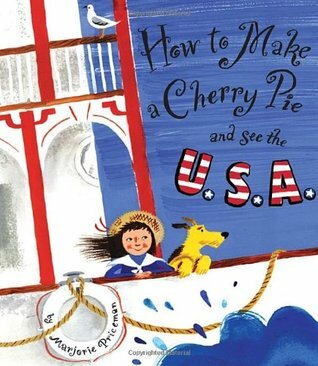 In the book a little girl travels around to find everything she needs to make a Cherry Pie! Fun illustrations, fun book, that my kids will love. I love how the book includes the Mississippi River because we just received fun items from our penpals from the Mississippi. This book is great for fun or while learning about the USA. I love the map at the beginning and the end. The ending map shows her tra This is such a fun book! I'm using it in our homeschooling studies as we learn about the states. In the book a little girl travels around to find everything she needs to make a Cherry Pie! Fun illustrations, fun book, that my kids will love. I love how the book includes the Mississippi River because we just received fun items from our penpals from the Mississippi. We recently read How to Make an Apple Pie and See the World and we liked it, so when we saw this 'sequel,' we decided we had to borrow it from our local library. This tale is a domestic version of the previous one and it is very similar in content. As with the other book, I couldn't help thinking of the If You Give... series by Laura Joffe Numeroff. I think it was just the (mostly) logical progression of actions, one after another. It was a bit strange, since instead of compiling ingredients to We recently read How to Make an Apple Pie and See the World and we liked it, so when we saw this 'sequel,' we decided we had to borrow it from our local library. It was a bit strange, since instead of compiling ingredients to make the pie, the young girl is compiling the basic materials and making the cooking instruments she needs to make the pie. The overall execution of the book is informative regarding the natural resources available in the United States, but it feels slightly awkward. In any case, this was an entertaining book to read aloud and we loved the humorous illustrations. We enjoyed reading this book together. This book truly got a LOL from me. I little silly and far fetched but fun and great pictures! I laughed and might learn how to make a pie. Though it is about the USA the recipe for the pie is in Fahrenheit and Celsius and I don't think my newer electronic stove can be converted to Celsius...I guess I will just have to turn the oven on to 425F because my Celsius button of 218 is broken! FUN ONE for the Fourth of July!! Cherry pie, sites around the U.S. and learning where some things come from and how they're made. Fun style learning! Similar to How to Make an Apple Pie and See the World, except instead of gathering ingredients for the pie, the author/character travels the USA collecting the raw materials needed to manufacture the cooking utensils. Shows the variety of natural resources available in the United States and, of course, includes a map of the states. Fun. Neither I nor my inner child appreciate these two books. I do like the idea of kids learning a little material science and a little geography, and the recipe is legitimate (in my experience it looks like it will succeed). But otherwise, just not for us. I preferred the Apple Pie version but still a great read. I've read How to Make an Apple Pie and See the World as well, and a lot of the same things I like and dislike about that one also apply here. It's the same cute travel idea, but this girl still wants to wander all over everywhere in no particular order for her shopping list. That being said, this is another cute and silly book introducing travel, cooking, and the idea that ingredients (and materials this time too!) come from different places outside the market. This is another I'd probably use f I've read How to Make an Apple Pie and See the World as well, and a lot of the same things I like and dislike about that one also apply here. It's the same cute travel idea, but this girl still wants to wander all over everywhere in no particular order for her shopping list. I am buying this to use with lower grade geography lessons as well as lessons on regions, and natural resources. It is clever and has a ton of geography in it. Damn, this girl has access to some crazy high-speed infrastructure. I am jealous. This book is done in the same style as How to Make an Apple Pie and see the World, which I loved. The focus is on kitchen implements instead of ingredients, and it takes place in the USA, so kids can learn about some of the states they may not know about. This is a great choice for homeschooling, taught in the spirit of the FIAR study on the first book. My only rub is the end of the story, which does not follow the spirit of the first book. I feel like that was a missed opportunity, but I still This book is done in the same style as How to Make an Apple Pie and see the World, which I loved. The focus is on kitchen implements instead of ingredients, and it takes place in the USA, so kids can learn about some of the states they may not know about. This is a great choice for homeschooling, taught in the spirit of the FIAR study on the first book. This is a very nice book to share with your student about the United States. All the states the little girl traveling to get the ingredients to make a cherry pie because the bakery shop was closed. I will use this for a text-to-teach connection. This is a fantastic way to teach about the states. The book has very colorful pictures. The little girl chose different ways to travel the states; by airplane, skies, rappelling down mountains, on a boat and bus. Take the students on a great adventure. I guess I need to read How to Make an Apple Pie and See the World because I was disappointed when she didn't go anywhere that grows cherries or any of the ingredients for a cherry pie. How are any of the resources she collects to make the equipment (such as a rolling pin, a measuring cup, a mixing bowl, and a pie plate) specific to a cherry pie? She could have been making any type of pie or many other types of pastries. I did really like the illustrations - especially the cute dog! After reading and enjoying How to Make an Apple Pie and See the World, we wanted more and picked up this book. We enjoyed this story which had Priceman's endearing illustrations and storytelling, but like another reviewer, we found this book a bit awkward. Unlike See the World, the girl has her ingredients, but needs to make her utensils; bowl, pie pan, rolling pin, measuring cup, etc. Even still, my daughter enjoyed the journey around the US, especially Alaska. While this wouldn't work for a storytime, it's a fun book. I like the pictures. I like the silly-though-teaching aspect of the resources and sites and even history taught as the girl journeys across the USA for supplies to make a pie. Love that it's about non-pie materiels she needs instead of the typical flour, sugar, etc. I love the dog as her companion and a few of the little things seen in the illustrations. A nice read, especially considering the 4th is coming up. Quick tour of the USA and a reminder of how much work goes into collecting natural resources and the process of using them to make the objects we use everyday. I think the author is trying too hard to be clever, which makes it feel like pages are missing: Go to NYC & have taxi drop you off at corner of Pennsylvania & Ohio. Then, you turn the page & you're at a coal mine (apparently in PA). On a practical level, the backtracking across the country also annoys me! I do like the dog accompanying the little girl. What a fun story with a little information about most of the states, where steel, glass, and plastic come from, travel, geography ("New Hampshire can usually be found between Maine and Vermont. "), and a tiny bit of cooking.